There might be some truth to the phrase “fighting like cats and dogs” and it might even lead you to believe that cats and dogs cannot live together, but that is simply not true! Many cats can coexist and even have a strong bond with their canine companion, especially when they are raised together from an early age. Some breeds such as Siberian Huskies may view cats as prey and so the combination isn't generally a great idea but there are plenty of cases where it has worked when the husky was raised from puppyhood with a cat. Other breeds such as Golden Retrievers and Labradors don't seem to have an issue at all. It all just depends upon the breed, temperament of the pets and age at which they are brought together. 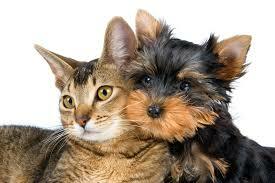 For the most part, many cats and dogs can live a happy life together!